Hello, and happy Thanksgiving! Hopefully you had a great one, with food, family, friends and, of course, bourbon. My wife and I brought a bottle of Old Weller Antique to Thanksgiving dinner ourselves, and it certainly went over well. Back to talking bourbon, and this week, it’s all about a new one appearing at shops all over Michigan – the Berkshire Mountain Distillers Cask Finished Bourbon, Founders Edition. Berkshire Mountain Distillers (BMD) is not a name we are familiar with here in Michigan, so it’s drawn particular note. Add in the fact that this bourbon is finished in Kentucky Breakfast Stout beer casks from the much beloved Michigan beer maker Founders, and it’s bound to turn some heads. 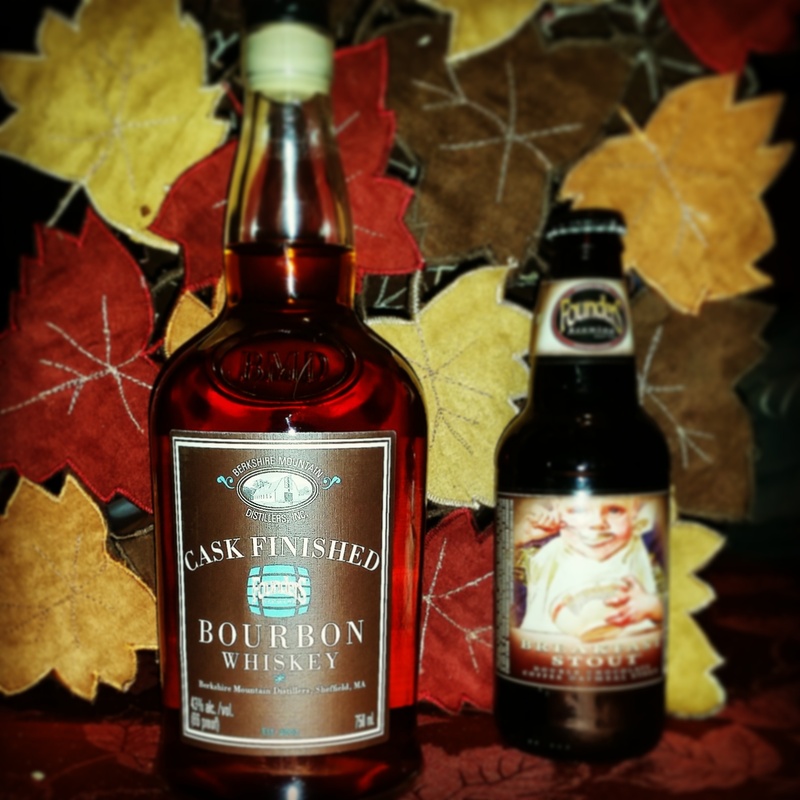 Dan’s Bourbon of the Week: Berkshire Mountain Distillers Cask Finished Bourbon – Founders. Note, that is a Founders Breakfast Stout in the photo, rather than the Kentucky Breakfast Stout, which is very hard to find this time of year. First, to find out more about the Berkshire Mountain Distillers and this drink, I went to their founder, Chris Weld. Chris let me know that Berkshire Mountain Distillers (which is in western Massachusetts) first distills their own bourbon and ages it for 4 years, before moving it to the finishing barrels. Their blend is heavy on the corn – 72% corn, 18% rye, and 10% barley (half of that is malted barley). They are finishing bourbons in barrels from 10 or so of the best small distillers in America, including Sam Adams (Boston), Big Sky (Montana), Cigar City Brewing (Tampa Bay, FL), Full Sail (OR), Hale’s Ales (Seattle, WA), Brewery Ommegang (NY), Smuttynose Brewing Company (NH), Terrapin (GA), Tröegs (PA) and Founders in Michigan. 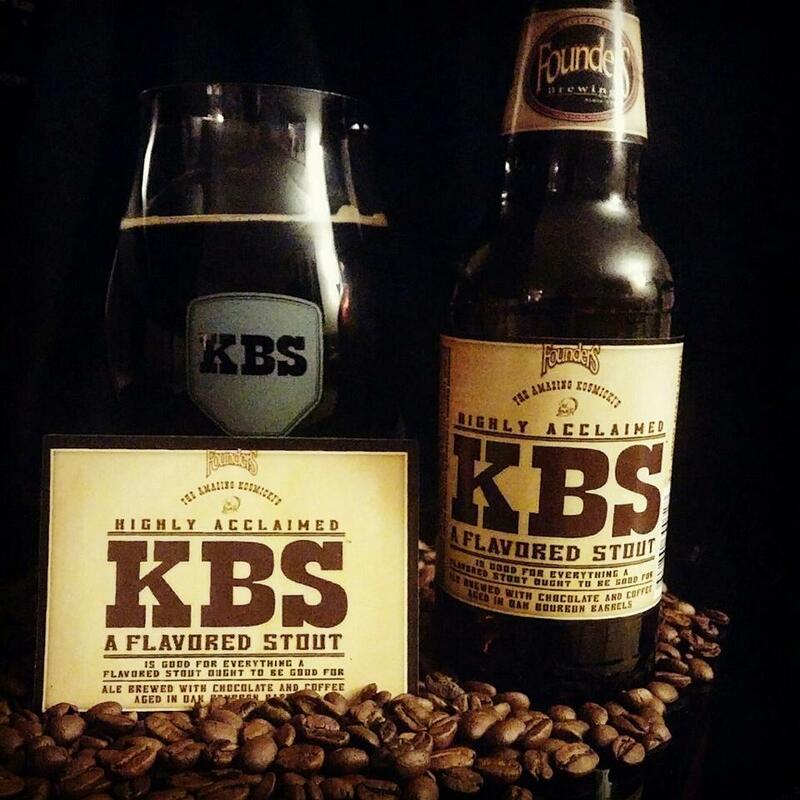 nosing KBS in the glass, but you’ll get the full effect on the backend when tasting. The way it hits my palette is coffee, chocolate, bourbon, finished with the smokiness of the barrels. To intensify the flavor and get the best of both worlds, I like to (with any specialty beer) take a sip, swallow, and then exhale out of my nose. I know it sounds silly, but talk about getting the full effect of specialty beer! I also like to take my time with KBS and other imperials. As the beer temperature starts to catch up with the temperature of the room, it begins to take new form. You’ll get different flavors along the way. I’ve begun to notice the higher the temperature, the more bourbon flavor you get. However, going beyond 70 degrees doesn’t interest me, and of course I don’t sit with a thermometer, so it’s more of a guessing game at the exact temperature. However, according to some studies (check out beergraphs.com) show that beer temperature, when in a room at a stable 70-71 degrees, will increase throughout an hour at an average rate of about 3.2 degrees every ten minutes, while alternating between holding the glass by the stem and setting it on a table/not holding it. So with all the knowledge I could put together, how is the bourbon? Dan’s Take: The nose of the BMD-Founders is very sweet, rich with caramel, corn, hints of vanilla and a fruitiness of raisin. What I didn’t notice was the scent of stout beer that is usually up front in beer finished bourbons. There was the subtlest hint of hops and barley, but so slight that it might have fooled me if I was tasting blindly. The taste was a bit different. The sweetness faded a bit, giving way to the cinnamon spiciness of rye. The Berkshire Mountain Distillery bourbon is a very, very smooth pour, and even with the stout finish, it holds up here. The sweetness that is there is more of a chocolate variety, with a touch of deep butterscotch. Finally, there is the stout beer, adding a bit of bitterness to the taste. Part coffee, part dark chocolate, it is definitely in the background, and far from overwhelming. The finish is a little more of that dark chocolate with a bit of toasted…pine? We liked the Berkshire Mountain Distillery-Founders, although the price point ($60+ in Michigan) is a bit high, especially with more and more finished bourbons available for less. More than anything, BMD Founders is smooth. Nicely done. Thank you to Chris Weld of Berkshire Mountain Distillery and Dave Cicotte of Good Pour. Reblogged this on Dave Cicotte.